One of my wall decorations fell on Friday. I came home to a gap. The hanger came off, which caused the portrait to slip down. Fortunately, it was caught on the one below it. It was a simple matter to glue the hanger back into position and replace the item where it was. These silhouettes are very special to me. 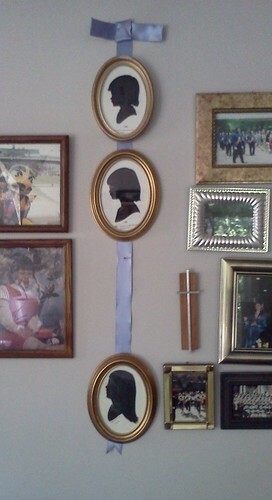 The top one was done when Carole was 4 years-old. A woman named Sally Newcom was doing silhouettes at a Lord & Taylor store near me. I thought that would be cool to have something like that done. I remember the little boy in front of us just screaming at the top of his lungs when asked to sit still. I explained to Carole what was going to happen and that she had to look straight ahead at me so the lady could cut out her head from black paper. She was very excited to have this done. Four years later, there was another Sally Newcom event. I don't remember where. The one that toppled was done when she was 14 and is also a Sally Newcom silhouette. The bottom one has no age on it so I'm hoping Carole remembers. It was done by a man and done at The Bookstore in Glen Ellyn. I think she was a senior in high school. Now, about the placement. Originally, I had these just hanging on the wall. They were two across in a box grouping. It was fine. When Carole graduated from high school, she wanted, as a gift, a road trip to tour Civil War sites. It was one of the most fun vacations we'd ever done. We hit Gettysburg first and then Spotsylvania, Chancellorsville, Antietam, and drove all the way to Richmond to visit the Museum of the Confederacy because they had just opened an exhibit on Robert E. Lee. After doing that, we headed home. Oh look, we're close to Monticello. Let's stop there. In touring Jefferson's home, one of the things the guide pointed out was the silhouettes on the wall in the drawing room. It was, she said, a very big event to sit for your silhouette. Jefferson's wife made sure this was done with all family members repeatedly. I think even some servants had their silhouettes done. 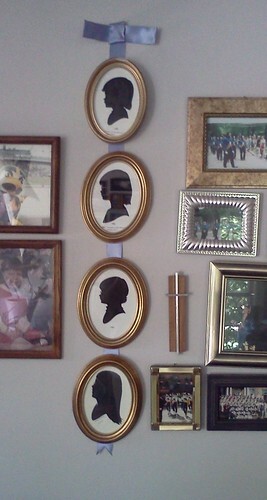 The silhouettes on the wall were mounted on top of a ribbon which matched one of the colors of the wallpaper. I remember looking at Carole and she at me as the light bulb went off in both our heads simultaneously. At the time, the living room was painted in beige and a light tan. We repainted it in its current colors over Thanksgiving weekend that year. Once the room was painted, we spent a long time at JoAnn Fabrics looking at ribbon. It had to be just the right color and width. The silhouettes in Monticello are much smaller than these which is why we opted to go with a wide ribbon. My walls are painted two tones, a very light gray-ish lavendar on top with dark gray-ish lavendar on the bottom. I know it sounds weird but the colors are found in a lap blanket a former friend gave me. You know I like color and the store matched the colors in the blanket perfectly. We measured from the top of the ceiling down and then marked where the silhouettes would hang. I made the "bow", put the nail through the inside of the bow and nailed the whole thing to the wall. Each silhouette is nailed through the ribbon into the wall. They aren't quite equal distance apart, but close. I wasn't going to put repeated holes in the wall to get them all 2 inches apart. It's been like this for years now, over a decade actually. It's kind of rare to have one of the silhouettes fall off the wall but it happens. If Carole can remember when the last one was done, I'll be sure to write the year on the back.